'Just a reminder, this family are a bit alternative.’ I caution T, my assistant manager. ‘No, just different.’ I tell him, less than convincingly. We’re parked outside a slightly scruffy 1960s built chalet bungalow. The front garden looks unloved, I’m guessing the ageing hippy wife is going for some sort of natural Old English meadow look, but I’m also guessing the greying guy next door, fastidiously cutting his border edges, doesn’t approve. A Druid with body paint might love wildflowers with questionable medicinal properties sprouting through the crazy paving, but this guy won’t appreciate weeds self-seeding in his lawn. ‘Oh and before we go in and measure up you need to know they are a shoes-off household.' I tell T apologetically. ‘Don’t worry.’ I tell him. H frowns at me, then grimaces. ‘Don’t tell me they provide those disposable paper slippers, for guests? We clamber out of the car and the grumpy gardener throws us a look of pure distaste. Two blokes in suits again. As nobody has died, he knows we’re either selling God or property. I give him a smile and he scuttles back indoors, as T picks up the briefcase, camera and digital tape-measure. ‘Anything else I should know?’ Asks T, as I open the creaky gate and head for the front door. ‘They’re vegans, so best not to mention your love of Nandos.’ I tell him. 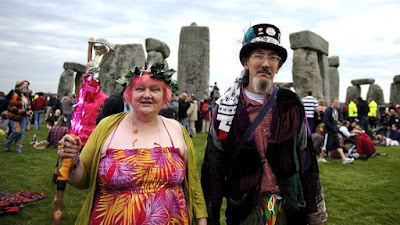 ‘Oh and the daughter is a bit alternative too.’ I tell T as I knock the door, no sign of a bell, the electrical waves probably disrupt the Ley-lines to Stonehenge. ‘Is that why you wanted me to come along?’ Says T, with a frown. ‘She wouldn’t be interested in an old man.’ Laughs T, as I put my finger to lips, detecting movement in the hall. ‘Just respect their choices.’ I say softly, as a shadow appears behind the opaque glass. ‘You think they are a bunch of weird-beards ignoring several hundred thousand years of evolution and our dental pattern.’ Snipes T.
‘Not if they are paying my invoice.’ I whisper, as the door opens a timid distance, and we’re challenged for ID. ‘It’s a right dump.’ Says T softly, once we’ve done the introductions and we set about measuring up. ‘They don’t like electrical appliances.’ I tell him, wondering how we’ll sell this dusty place to potential viewers. ‘Tin-foil hat when he goes into the shopping centre?’ Posits T, with a chuckle. Probably. ‘Can we just come in to measure-up your bedroom?’ I ask, at the daughter’s door. She looks at us through heavily made-up eyes, I’m hoping no animals have been used while testing the kohl, or she’ll be self-harming before teatime. ‘Suppose.’ She says flatly. The girl looks like she good do with a good meal, preferably involving protein and some dead chickens. ‘You looking forward to moving? Asks T breezily, as I l search for something to photograph that won’t deter buyers. For a moment I think she’s going to cry. ‘North Wales is lovely.’ I fib. ‘There’s no phone signal.’ Grumps the girl. Yes, that’s why your parents are going there. ‘Think it’s more about animal welfare.’ I tell him unconvincingly. T shakes his head. ‘Spot on with that bunch of freaks.’ Concludes T.